Today's Worship Quote is another from Eugene Peterson's book Answering God, a wonderful study of how to use the Psalms as tools for prayer. Peterson was Professor of Spiritual Theology at Regent College in Vancouver, British Columbia. Prayer recovers the shape of our creation. We are created in "the image of God." We are declared, on the authority of Genesis, "good." We, and everyone and everything around us have this basic beauty, this wondrous goodness. But we very often don't feel at all good. We do not perceive ourselves "in the image of God." We are conscious of failure and inadequacy; we experience criticism and rejection; we feel lousy. The memory of our good creation is obscured in a thick fog of failure and inadequacy. Prayer is a reentry into the reality of our good creation. The Psalms, all spoken out of this ordered and purposed beauty, activate our memories of creation. Always the Genesis milieu is implicit; sometimes it is explicit. 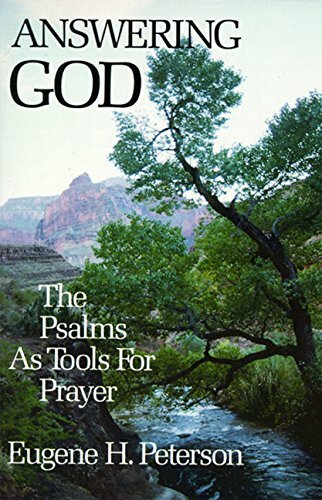 When we pray the Psalms we consciously enter the reality of our good creation. Our lives are bracketed by God: "O Lord, our Lord, how majestic is thy name in all the earth!" is the first last line of both Psalm 8 and of our lives. Within the brackets-and there is nothing that is not within the brackets-our creation takes place. - Eugene H. Peterson, Answering God: The Psalms as Tools for Prayer, (New York: HarperCollins Publishers, 1989).